Cerevellum is an interesting cyclo-computer concept, but it is really much more than that. 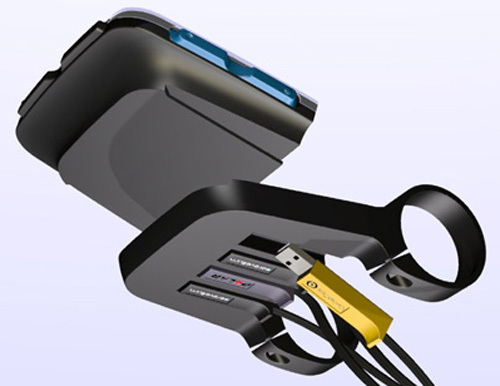 The system is expandable by way of 4 USB connections on the underside of the head unit so the user can choose the extra features that he or she wants; GPS mapping, power meter, heart rate monitor, etc. Sounds good so far, but if you look at the rendering, you will see the most interesting feature of the Cervellum, the hindsight component. A small lens in the handlebar end plug (or optionally attached to the seatpost) gives the rider a rearview that is shown right on the head unit’s display screen. Cars approaching from behind can be clearly seen as the rider glances down to view the computer data. I think this is a great idea; much more information about the concept is available on the Cerevellum website. Other modules can be plugged in, via standard USB ports, including a power meter, a heart monitor and GPS. Right now the Cerevellum is a concept, but there is a fully working prototype and Solida is looking for a manufacturer. 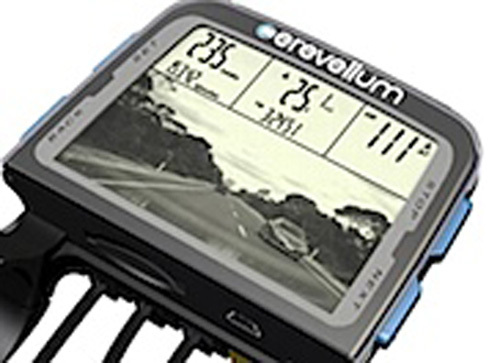 Prices are expected to be around $299 for the head unit, $60 for a cyclometer, $200 for the GPS unit and $800 for the power meter (including equipment).